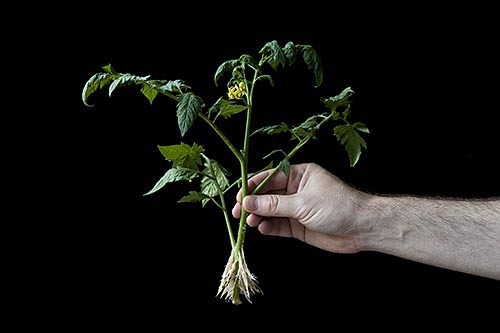 The Tomato Hydra – Tomato Town organically grows heirloom tomatoes in the greater Kansas City area as well as Johnson County, Leawood, Lenexa, Olathe, Shawnee, Merriam KS, Independence MO and Kansas City Missouri, KCMO. Varieties include: Cherokee Purple, Brandywine, Stupice, Carbon, Black Krim, Black Cherry, Yellow Pear, Absinthe and Aunt Ruby’s German Green. It's alive! Farmer T holds an Isis Candy ready for planting. Farmer J admits that she can be a little too soft-hearted to be a true gardener. Weeding still troubles her, but she is slowly coming around. To her horror, she discovered that weaving the branches into the fence sometimes results in the breakage of a branch or two. While some might toss these branches into the compost pile, Farmer J prefers to root them. It turns out that tomato plants do not need much encouragement. It is enough to drop the branches in a water-filled vase. Within a few days, they are ready for action. This entry was posted on Saturday, June 19th, 2010 at 12:25 pm. It is filed under Planting, Spring Posts. You can follow any responses to this entry through the RSS 2.0 feed.